Flieder Floxx: Me? A Blog Award? Never!! So imagine my surprise when I logged on today to find that I had won this! It was bestowed on me by the exceptionally talented writer of The Blogger Formerly Known As... whose blog I read religiously. Check it out if you get the chance - it's wonderful! Lenore at Lather. Write. Repeat. Congratulations to everyone! Please pass the award on to other deserving blogs. As for me, I'm going to go and bask in the glory of my first award since I came third in an egg and spoon race in Grade Two. Lovely blog - yes you do deserve an award! I've just happened to meander over from Klahanie's blog and your post on typo's made me smile, thanks. Oh wow, how cool. Thank you so much for thinking of my blog. That was very kind of you. And trust me, she who will not be named will become much more willing to endure embarassment you when college tuition enters the equasion! Congratulations on your well deserved award, and thank you so much for mine! I'm very flattered, thank you. Will be sure to pass it on. Omawarisan and Mid 30's - you two really do deserve awards - your blogs always make me smile! And thank you for meandering over Joanne!! Hi Tracey. My comment was going to be almost exactly the same as Joanne's, above, including the reference to the typos post. Instead I'll say congratulations on this well deserved recognition! Thank you very much Bazza. I'm super pleased, and it's given me a bit of a boost to keep writing! 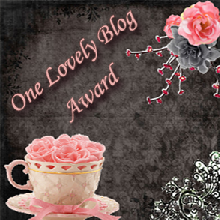 You are a truly worthy recipient of the much coveted 'One Lovely Blog Award'. Tracey, you do a fantastically, wonderfully, awesome blog. I will make sure nobody tries to sit in your chair at the 'Blogger Academy Awards'. You're very welcome, and a worthy award recipient too I might add. As for the egg and spoon race, it has been my one and only athletic forte...yet I still only placed third (sniffle sniffle). congratulations to YOU on the much deserved award! and thank you so much for passing this award on to me!!! and please know that i am STILL laughing at your previous post!!! !